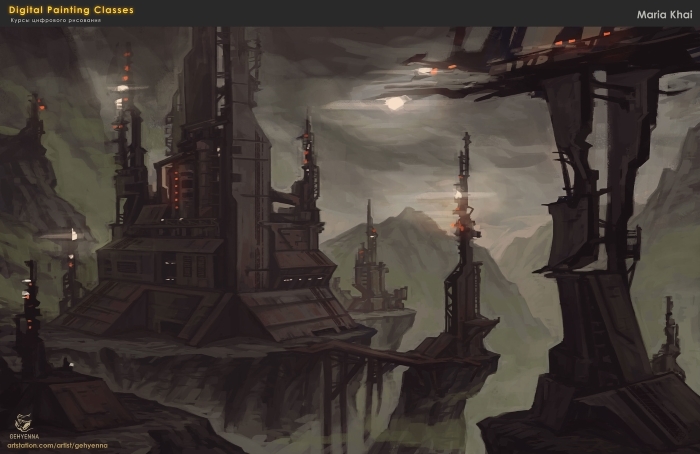 Intent: ​To flesh out the military fortress established on Agamar. Accessibility: As the primary military installation on Agamar only members of the Sith Brotherhood or Imperial Military with proper clearance can gain access to the base. Description: The fortress known as Blackrock Spire was established on a very defensible position high in the mountains, named after the unique stone that surrounds it this military garrison is the primary military installation on Agamar. A fort established in the mountains in a highly strategic location Blackrock Spire is tucked into a high position where advancing forces are forced to constrict themselves in the only mountain passage up to the fort, where numbers count for absolutely nothing. ​A rather unique trait for the military installation is that the barracks was expanded allowing for additional troops, the need was felt due to the location and the presence of other active non military personnel on the world. There are two different ten meter high death fences that protect the entire perimeter of Blackrock Spire. The first one begins at the base of the pass leading up to it which is accessible via a force field gate flanked on either side by guard towers and a catwalk above, all of which are always manned by soldiers. The entire pathway leading up to the main base is lined with a great electro-mine minefield that can only be activated and deactivated through the closed circuit security system of the base. The second fence completely surrounds the entire spire and there is a second gate checkpoint here where there is guard towers every fifty meters. The fortress itself is spacious with a central spire slicing up into the air. Much of the fortress however actually goes down through the mountain in a network of stark hallways, barracks, storage facilities, detention wing, and even legionnaire training grounds. ​The history of Blackrock Spire is a short one, it was created after the New Sith Empire came to Agamar to annex the world but it was also inhabited by the Droid General Aut-X and his armies. After a very successful negotiation with the General one of the major terms of the General's induction into the Empire was that a military installation would be installed on Agamar and it would maintain the primary defensible installation. The droid general was very cooperative and a deal was struck bringing him and his factories into the Empire. After leaving Agamar the Shadow Hand called for the Supreme General to oversee construction of the new garrison with specific orders to take the presence of the droid general into account. Mallear had a strategic location chosen in a mountainous region where attacking forces were unable to drop directly on the fortress and forced to approach through the one narrow pass where numbers would count for nothing. A two perimeter system was set up with two great death fences, as well as a great mine field over the entire area. The fortress was at last finished ​and the Supreme General named it Blackrock Spire after the infamous rocky terrain around it. It became the primary military garrison for the Sith Empire on the world. Edited by Darth Prazutis, 21 May 2018 - 09:59 AM. It all looks good to me except for one tiny thing. Can you link the dominion in the links section please? Please provide a link to the planet. Please provide a link to the faction. This is blank. If this is intentional, you can just add "N/A". Please add a Security Rating. Please include military personnel in the population field, as this is a military base. You don't need to specify what is what since you have it in the Security field already. You have planetary shield listed twice.